"Somewhere, possibly in the transfer from the multi-channel tape to the stereo master, a polarity had been reversed. This is not the same thing as a reversed left/right channel which puts a stereo picture out of phase & makes the sound unlistenable, but a much more difficult to pin down event that can be triggered by something as simple as a badly wired plug in the overall system which, nonetheless, removes some of the punch & presence from a finished recording." The special edition of Skylarking also restores the original tracklisting as well as the record's original artwork (posted above) which was suppressed by Virgin Records. 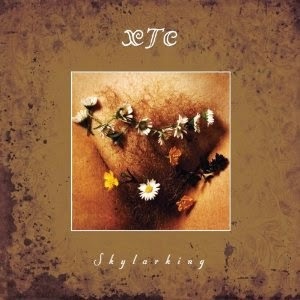 The album is available to pre-order XTC's webstore and Amazon. Meanwhile, Andy Partridge, who runs XTC's twitter, sent out a flurry of tweets over the past 24 hours. His tweets are a must read for fans -- Partridge sets the record straight with some very fun facts about XTC and more. Check out a few of his tweets below, and read them all here.